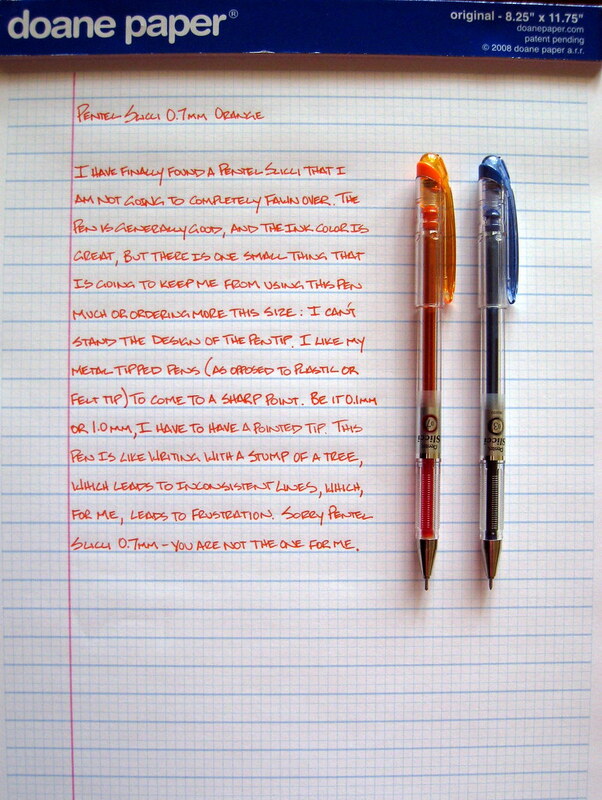 My affection for the Pentel Slicci runs deep, but not deep enough to allow the 0.7mm model into the family. It writes really smooth and the orange color is great, but for picky types like myself, there are some things I just can't get past. In this case, it is the shape of the tip. The design is very blunt, like you are writing with a sawed off log. In my infinite wisdom, I didn't take an extreme close-up for comparison, and I don't have the pen with me this morning, but hopefully you can make out the difference between the 0.7mm Slicci on the left, and the 0.3mm Slicci on the right. Most pens that have a wide range of widths at least keep the design the same, like the Pilot G-2 and Uni-Ball Signo lines for example, but in this case there has to be something with the engineering of the tip that is preventing that. I will be sticking with my 0.3mm and 0.4mm Pentel Sliccis for now, and that suits me just fine. Posted on March 4, 2009 by Brad Dowdy.